The tube or line from the pitot tube to the airspeed indicator applies the pressure of the outside air to the indicator. The indicator is calibrated so various air pressures cause different readings on the dial. 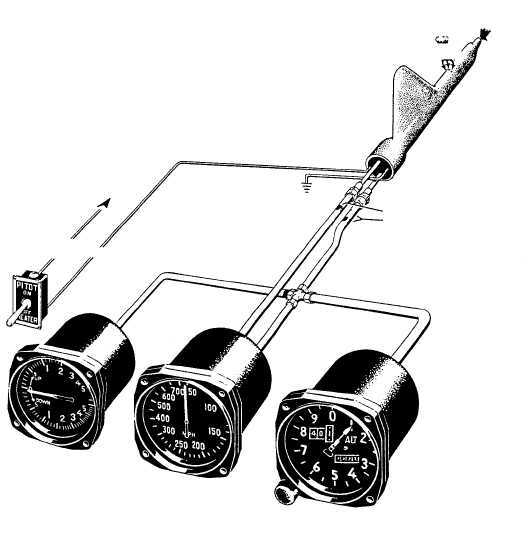 The indicator interprets air pressure from the pitot tube and reflects airspeed in knots. When working on or around the pitot tube or static ports, do not obstruct the openings. Obstructed openings restrict the supply of air to the indicators and cause false readings. CAUTION Severe burns may result from touching a pitot tube with the pitot tube heaters on. Be sure the pitot tube heaters are off before installing protective covers. Altimeter The altimeter (fig. 7-7) shows the height of the aircraft above sea level. The face of the instrument is calibrated so the counter/pointer displays the correct altitude of the aircraft. 7-7 TO FUSE OR CIRCUIT BREAKER IMPACT (PITOT) PRESSURE PITOT-BLACK STATIC-BLACK/LT GREEN COLOR CODE RATE OF CLIMB AIR SPEED ALTIMETER ANF0706 STATIC PRESSURE Figure 7-6.Pressure measuring instruments. 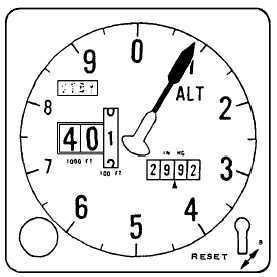 ANF0707 Figure 7-7.Counter/pointer altimeter.